You are cordially invited to join us this summer for Weekender 2018, the Dragons Golf Club’s annual intra-club team match play road trip — this year, we’re going down to Santa Barbara, a new adventure for the Dragons. This is our signature event, and it is always a blast to travel together and play the best courses this state has to offer. For one weekend, we will divide the Club into factions of RED and BLACK. We will go Ryder Cup-style with a Four-Ball on Day 1, and Match Play Singles on Day 2. We will play two Bucket List-worthy challenges in Rancho San Marcos and Sandpiper Golf Club. 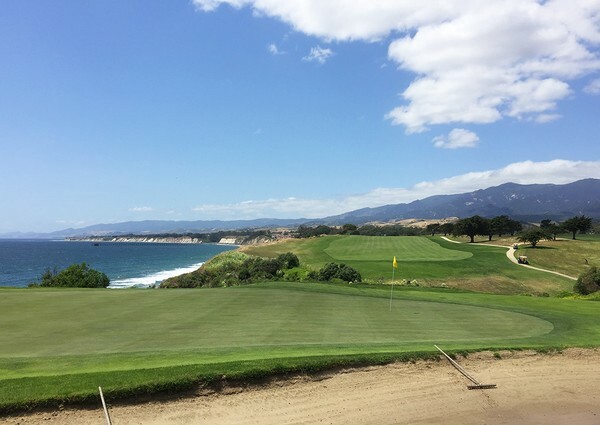 Rancho San Marcos is a Robert Trent Jones Jr. modern classic in the Central Coast, while Sandpiper is often referred to as the “Pebble Beach” of the Central Coast, with several ocean holes rivaling that of the course in Monterey. Team Red will be captained once again by defending Dragon Cup champion Mike Lum, while the defending Weekender champion Team Black will be led by Davis Lee. Those who can get away early on Friday can join club CFO Mike Gui at a comparably scenic Glen Annie Golf Club for a bonus round on Friday afternoon. We have a block of lovely hotel rooms reserved for us by Weekender coordinator Chris Wong. On Saturday night, we will have our traditional Weekender members’ dinner and the Captains will do the singles match-up, President Cup style. Immediately following the conclusion of the final round on Sunday, we will gather at the Rancho San Marcos clubhouse for our awards reception. Registration is now open, at https://dragonsgolfclub.org, and closes on Sunday, June 10. The entry fee is only $325, including two rounds of golf, the Saturday night Members dinner, the prizes and the Sunday awards luncheon. On Thursday, June 21, following the Club shot-gun tournament at Lake Merced Golf Club, there will be a members-only buffet dinner at Lake Merced, and the two team captains will conduct the draft of the RED and BLACK squads. All members are strongly encouraged to attend this entertaining proceeding, and to lobby the two captains to avoid being picked last. We look forward to seeing you in July, as we continue a club tradition and celebrate good golf and good food with good friends. “The Hotel’s room rates are subject to applicable state and local taxes (currently 12%) and California Tourism Fee (currently $0.50) and Tourism Business Improvement District Fee (currently $3.30) in effect at time of check-out. “Please have the guests in your group directly call Marriott Reservations at 1(800) 321–2211 or (805) 968–0500 on or before Friday, June 22, 2018, (the “Cutoff Date”) to make their sleeping room reservations. Please advise guests to identify themselves as part of the Dragon Golf Club Room Block group staying at the Courtyard Santa Barbara Goleta, located at 401 Storke Road, Goleta, CA 93117. “All reservations must be guaranteed with a major credit card. The hotel will not hold any reservations unless secured by credit card. All members are cordially invited to join us on Saturday night, July 21, for the traditional Weekenders Members Dinner, with the restaurant to be announced in due course by Mike Gui. Members will be emailed our dinner menu and asked to provide entrée selection in advance. For the members coming down (or up) to Santa Barbara early on Friday, there will be a casual group dinner following golf. Details will be forthcoming. The registration fee is $325, which includes both rounds of golf with cart, the Saturday night members dinner, tournament prizes and the Sunday awards luncheon. Significant others and children are welcomed to join us for the members’ dinners. RSVPs for the Friday bonus round at Glen Annie will be separately administered via email by Mike Gui. Members should register for the tournament online as instructed in your invitation. The registration deadline is Sunday, June 10. See you at Lake Merced for the Draft!